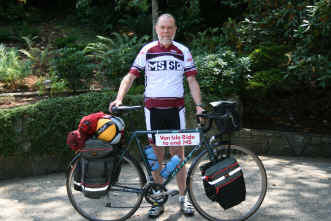 Trek team member David Cox's mission to help the MS society. 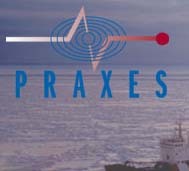 Canada is a key leader in establishing world-class research projects. For example, a Canadian-led, $4.3 million groundbreaking study in children is continuing to shed new light on the key triggers that lead to the development of MS, and is made possible through fundraising activities like this. Blurry vision. Overwhelming fatigue. Cognitive issues. Paralysis. Muscle weakness. These are only a few of the possible symptoms of Multiple Sclerosis, the most common disease of the central nervous system. Multiple Sclerosis is an unpredictable, still incurable, often debilitating neurological disease with a disproportionate presence amongst Canadians, affecting, in particular, women and young people. It is usually diagnosed during our family and career building years, the years that feel the most promising and exciting. The MS Society of Canada has been holding summer cycling fundraising rides for about 20 years. This is my 16th MS Bike Tour and my fourth Multiple Sclerosis fundraising tour in B.C. after 12 years of cycling in Ontario ’s tour rides encompassing some 30 rides covering almost 3000 km. This year though I have taken on the volunteer role of Site Coordinator for the South Vancouver Island Chapter’s annual two day Cowichan Valley Grape Escape tour. As a result, I will not be able to directly participate in the ride. According to a 2005 Leger Marketing survey, 1 in 2 Canadians know someone with MS. That means someone in your church group, sports team or work place - perhaps even you - knows someone with MS. So here I am, bike helmet in hand, asking for your help. I will do the sweating and pedalling for you. I would be more than pleased to receive your support - please open your heart and your wallet to sponsor me. I have made my commitment; will you join me? INSPIRING STORIES FROM PEOPLE AT ALTITUDE WITH MS. Sometimes, people's stories are so special and so inspiring, they deserve a special place all their own! In this section, read about some MSérs who have faced their challenges head-on at Altitude with Attitude! Denise Maglio from Nelson B.C. successfully treks to Everest Base Camp with Peak Freaks. Denise and her husband Terry walk the time tested trails without missing a beat. Taking her challenge to altitude. More an more people who have been diagnosed with the complicated disease are heading out to the hills. A positive attitude is nurtured and feelings of wellness is what many say the Everest journey gives them. Congratulations Denise! Photo: Denise and husband Terry at 12,500 feet, Sherpa village of Namche Bazaar behind them. The team successfully summited Kala Pattar 18,000 feet and finished off with a trek to Everest Base Camp. Just before being diagnosed with remittent MS this summer, I had made plans to travel half way around the world to climb in the Himalayas. After having my legs go numb a few times, and having blurry vision for two full weeks, the doctor told me to see him immediately if I ever had bad headache. Sure enough, I soon had a serious headache that sent me to the hospital, where I had a CT scan, and then an MRI. I Then came the diagnosis, a lot of tears, and the feat that I would never enjoy the mountains again. After the diagnosis, giving up this trip of a lifetime would have been an easy choice. At 20 years old, taking on a major high altitude mountain climbing trip is daunting enough. Hearing the news from my doctor made my question a lot of things about my life, including the wisdom of taking such a trip. That afternoon visit to my doctor gave me lots to think about. I thought long and hard about the things I just assumed I would do with my life. I'm young, and I had always thought of the world as a wide open place that I would explore. I'm passionate about skiing, climbing, mountaineering, and mostly anything to do with the outdoors. At first I feared that MS would change these things, and that I would have to give up many of dreams and outdoor pursuits. After some research, discussions with my parents and doctors, and some soul-searching, I decided to go ahead with my trip to the Himalayas. On September 19, 2004, I left Canada for the long trip to Nepal, a country deep in the Himalayas. My goal was to climb Mt. Ama Dablam, a 22,000 foot mountain in the Khumbu Valley next to Mount Everest. After arriving in Nepal, I met with expedition leader Tim Rippel Mountain Guide/Operator of Peak Freak Expeditions and the rest of the expedition team members for the short flight from Kathmandu to the village of Lukla. Our team included 7 others, from various places around the world. I was the tallest, and the youngest by about 12 years. The approach to base camp of Ama Dablam is quite challenging. There are no roads in the Khumbu Valley, just well-traveled just yak trails that wind along the edges of steep mountain valleys. After three days of hiking, we set up our base camp at approximately 14, 000 feet. The views from this height were stunning at least when the clouds cleared. In total we spent twenty days on the mountain, both climbing and acclimatizing. From base camp, our team established camps higher up on the mountain in order to prepare for the final summit push. Unfortunately I didn't make it to the summit. Like a few others on our team, my body became host to a parasite while in Kathmandu. It was sucking all my energy and gave me stomach problems that are best not described. Three of our team did stand on top and I was very proud of them. While climbing, I realized that my goal wasn’t to stand on the summit of Ama Dablam. What drew me to Nepal, despite my diagnosis, was the challenge and wonder of the journey itself. We’ve all read and heard quotes and popular sayings that talk about the importance of the journey, not the destination. Being able to realize the truth of this popular piece of wisdom, while surrounded by the tallest and most beautiful mountains on earth, was a life-changing experience for me. We all experience the thrill of a great trip, and the unknown challenge that lies around the corner. It has become an excellent analogy for how I want to live my life. I’ve learned to become grateful for the journey of each day – whether it is riding my bike, or climbing with friends. I can’t wait for this winter, as ski season is just beginning here in Canada. I can’t wait to return to the mountains, where I have so many memories of past trips, and the knowledge that there are many more memories to be created. People ask me how my diagnosis has affected my active lifestyle; they want to know why I still climb, ski, and ride. The answer is that I have no plans to change my life because of one obstacle. To me, that would be absurd. MS is another challenge – perhaps larger than some we encounter on our journeys, but not so large that it can’t be overcome, or worked around. I’m still me – I think, I move, I act as normally as any 20 year old guy can. The only difference now is a greater degree of caution in my movements, and an increased ability to listen to my body. I learned so much on this recent trip about my body, and how it reacts. I know that I will continue to discover limits to what my body can do, and that I will have to listen carefully to my body so I don’t worsen my condition. But I will continue to climb, if for no other reason than – simply – because I can. On a regular basis I rock climb, mountain bike, go mountaineering, backcountry skiing and more. Dealing with my MS is no easy task, but I’m getting the hang of it. A consistent healthy diet and sleep schedule are the most important aspects of my life. If I stick to the regimen, I feel healthy all day and always have the energy I need for work and play. I don’t take any special milkshakes or unusual remedies to make me feel better. I have learned to accept the changes to my lifestyle, and the fact that there aren’t a lot of choices except to look MS in the face, and smile at it. Part of smiling in the face of MS involves setting goals – something that I would not being doing right now if it had not been for MS. I am planning trips to South America and Africa over the next couple of years. More immediately, my friends and I are planning a trip to a remote mountain in British Columbia this May, to ski and climb. My biggest goal is to live life to its fullest, and to do it passionately. It has been rewarding to write this, as I know that people find motivation in all sorts of different places. I hope people who read this are also finding ways to live with optimism, and hope, and to find something they love and pursue it with passion. I don’t plan to hold anything back, and I hope you don’t either. KRANKING FOR KATHMANDU. Locals Sandy Mitchell, Con Diamond and Tim Rippel will be pedaling their mountain bikes from Lhasa, Tibet to Kathmandu, Nepal starting next week. In total the trip will last 17 days and cover 1,000 kilometers. As a logger and accomplished adventure sport athlete, Nelson’s Sandy Mitchell evidently knows the old adage first hand- the bigger they are they harder they fall. At the age of 46, Mitchell is likely more adept than most men half his age when it comes to conquering feats of physical and psychological demand, in this case feats undertaken on two wheels. 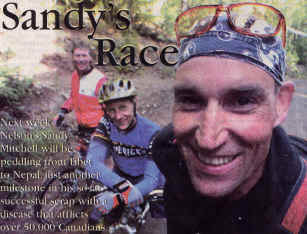 Mitchell is a long-distance mountain bike racer. Starting next week, the gregarious father of two will set out to put what may be the most extraordinary notch in his seat post- a 1,000 kilometer, 17- day ride across the Himalayan Mountains, a journey that will take him to the highest inhabited point on Earth, Nepal’s Rongbuk Monastery, located 17,900 feet above sea-level. The ride will start in the Tibetan capital of Lhasa and end in Kathmandu, Nepal. At one point Mitchell will descend for two days, dropping nearly 15,000 feet, arguably the world’s longest possible downhill. Passing just north of Mt. Everest, the trip will pit him and a group of seven others against the same desolate, starkly beautiful landscape that challenged the world’s greatest mountaineers for nearly a century. “Packing your clothes is the toughest thing,” Mitchell laughed as he prepared for the 20-hour flight to Kathmandu. Extremes, however, are a form of entertainment for Mitchell, a flabless 6-foot three, 220 pounds. Two years ago, he completed the TransRockies Challenge, a grueling 600-kilomter hagger through the undulating peaks, valleys and human-less void that separate Fernie, B.C. from Canmore, Alberta. Racers peddled and pushed through a mix of snow, sleet, sun and buffeting winds for seven days. Last year, Mitchell bagged the La Ruta de los Conquistadors, a three-day, west-to –east coast race across the jungled interior of Costa Rica. Granted, in an age of unprecedented accomplishment in the so-called extreme sport genre, Mitchell’s madness is less than commonplace, though far from unparalleled. But there is something that sets the logging contractor’s weekend-warrior efforts apart. For 100- per-cent healthy folk-, which Mitchell is not-, those efforts might well seem extraordinary. Mitchell’s Himalayan peddle will mark a milestone in a personal race that officially started six years ago and will likely end with his own demise, maybe sooner he suggests, maybe later. In 1998, at the age of 40 Mitchell was diagnosed with Multiple Sclerosis (MS). He unwillingly joined the ranks of some 50,000 Canadians who live with the disease, which attacks the central nervous systems, disrupting the transmission of nerve impulses. In some cases MS is rapidly fatal. There is no cure. Canada has on of the highest incidences of MS in the world. Then he had a second attack. The disease quickly hindered basic bodily functions, like walking and passing urine. Mitchell was forced to wear a catheter. Rather, he changed his life. He gave up junk food, couch surfing and booze. “I like a glass or two of wine. Good wine,” he laughs. “But then I’m done.” And he embarked on a newfound challenging past times, long-distance mountain biking, road riding and skate skiing. When he feels the on-set of an attack- “they’re weird, like someone throws mud at your back and it sticks,” he explains- he heads for the hills. Mitchell’s battle with MS has also garnered him friendship. His partner in grime- a wingman for muddy epics in the Rockies, Costa Rica and the upcoming Tibet-to-Nepal trip- is Con Diamond. The 56-year old, a semi-retired restaurateur and father of three, has been riding with Mitchell for the past five years. Together the pair tackle 12-hour-long trips-just for fun-along the endless logging road and single track that cris-crosses the mountains above Nelson. Diamond, a big distance cyclist for the past 25 years, says Mitchell’s greatest asset is attitude that seems to flourish at altitude. Diamond recounts an exemplary tale of Mitchell’s character and sheer brawn. During one particularly difficult leg of the Tran Rockies, he offered to carry Diamond’s bike. He was already carrying his own. “So he carried my bike and his bike Diamond smiles. Mitchell’s energies in the face of adversity have even made a mark on a man of equal strip. Canadian mountaineering veteran Tim Rippel, who has been on Everest six times, once solo, will be leading the Himalayan mountain bike trek. He and his wife Becky have been leading treks and climbs in the Everest region since 1991. “The fact that he’s go this illness, and doesn’t let it get him down, like most people would… He has amazing drive to live life hard. Two years ago Mitchell convinced Montreal-based pharmaceutical company Berlex, manufactures of a drug that slows the effects of MS, to sponsor him on his outlandish adventures. They didn’t hesitate. “We want to encourage people with MS to live more fulfilling lives,” says Berlex spokesman Karl St. Pierre. Two years ago after being nominated by wife Patty, Mitchell won the nation-wide Champions of Spirit award; an award for inspiring lives lived by those afflicted with Multiple Sclerosis. Asked how MS affects his life today, Mitchell’s answer is terse. © 1991 - 2011 Peak Freak Expedition Inc. - All Rights Reserved.